Islam News Room - Prophet? Messenger? Proof? Who Was Muhammad - Really? 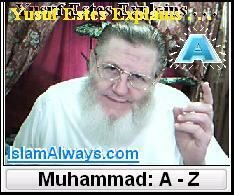 What Do We Know About Muhammad (peace be upon him) . . . .
Sheik Yusuf, a former Christian, known for his humor and straight talk - speaks about the prophet Muhammad (peace be upon him)..
Lamartine, the renowned historian, speaking on the essentials of human greatness, wonders: "If greatness of purpose, smallness of means and astounding results are the three criteria of human genius, who could dare to compare any great man in modern history with Muhammad? The most famous men created arms, laws and empires only. They founded, if anything at all, no more than material powers which often crumbled away before their eyes. This man moved not only armies, legislation, empires, peoples and dynasties, but millions of men in one-third of the then inhabited world; and more than that, he moved the altars, the gods, the religions, the ideas, the beliefs and souls...his forbearance in victory, his ambition, which was entirely devoted to one idea and in no manner striving for an empire; his endless prayers, his mystic conversations with God, his death and his triumph after death; all these attest not to an imposture but to a firm conviction which gave him the power to restore a dogma. This dogma was two-fold, the unity of God and the immateriality of God; the former telling what God is, the latter telling what God is not; the one overthrowing false gods with the sword, the other starting an idea with the words. Philosopher, orator, apostle, legislator, warrior, conqueror of ideas, restorer of rational dogmas, of a cult without images, the founder of twenty terrestrial empires and of one spiritual empire, that is MUHAMMAD. Mahatma Gandhi, speaking on the character of Muhammad (PBUH) says in 'YOUNG INDIA': "I wanted to know the best of one who holds today undisputed sway over the hearts of millions of mankind...I became more than convinced that it was not the sword that won a place for Islam in those days in the scheme of life. It was the rigid simplicity, the utter self-effacement of the Prophet, the scrupulous regard for his pledges, his intense devotion to his friends and followers, his intrepidity, his fearlessness, his absolute trust in God and in his own mission. These and not the sword carried everything before them and surmounted every obstacle. When I closed the 2nd volume (of the Prophet's biography), I was sorry there was not more for me to read of the great life." Thomas Calyle in his 'Heroes and Heroworship', was simply amazed as to "how one man single handedly, could weld warring tribes and wandering Bedouins into a most powerful and civilized nation in less than two decades." K.S. Ramakrishna Rao, an Indian professor of Philosophy, in his booklet "Muhammad the Prophet of Islam" calls him the "perfect model for human life." Professor Ramakrishna Rao explains his point by saying, "The personality of Muhammad, it is most difficult to get into the whole truth of it. Only a glimpse of it I can catch. What a dramatic succession of picturesque scenes. There is Muhammad the Prophet. There is Muhammad the Warrior; Muhammad the Businessman; Muhammad the Statesman; Muhammad the Orator; Muhammad the Reformer; Muhammad the Refuge of Orphans; Muhammad the Protector of Slaves; Muhammad the Emancipator of Women; Muhammad the Judge; Muhammad the Saint. All in all these magnificent roles, in all these departments of human activities, he is alike a hero." You may be a Christian Protestant, Catholic, Jew, an atheist or an agnostic; or you may belong to any of many different religious denominations existing in today's world. You might even be a coummunist or believe in man's democracy as the rule on earth. Not so this man. Muhammad (PBUH) accomplished so much in such diverse fields of human thought and behavior in the fullest blaze of human history. Every detail of his private life and public utterances has been accurately documented and faithfully preserved to our day. The authenticity of the records so preserved are vouched for not only by the faithful followers but even by his prejudiced critics. Muhammad, peace be upon him, was a religious teacher, a social reformer, a moral guide, an administrative colossus, a faithful friend, a wonderful companion, a devoted husband, a loving father - all in one. No other man in history ever excelled or equaled him in any of these different aspects of life - but it was only for the selfless personality of Muhammad, peace be upon him, to achieve such incredible perfection. Muhammad, peace be upon him, was nothing more or less than a human being. but he was a man with a noble mission, which was to unite humanity on the worship of ONE and ONLY ONE GOD and to teach them the way to honest and upright living based on the commands of God. He always described himself as, 'A Servant and Messenger of God' and so indeed every action of his proclaimed to be. Today after a lapse of fourteen centuries, the life and teachings of Muhammad (PBUH) have survived without the slightest loss, alteration or interpolation. They offer the same undying hope for treating mankind's many ills, which they did when he was alive. This is not a claim of Mohammed's, peace be upon him, followers, but the inescapable conclusion forced upon by a critical and unbiased history. The least YOU can do as a thinking and concerned human being is to stop for a moment and ask your self: Could these statements sounding so extraordinary and revolutionary really be true? And supposing they really are true and you did not know this man MUHAMMAD, peace be upon him, or hear about him, isn't it time you responded to this tremendous challenge and put in some effort to know him? We invite you to make a discovery of this wonderful man, MUHAMMAD, peace be upon him, the like of whom never walked on the face of this earth. "Click here for website - Prophet Of Islam"